Have you ever watch your cat go crazy, role around the floor and then make you one of his faviorte catnip dube so you can taste the aromoa of fine catnip. You should know even though your cat drugged around their catnip all over the house, it’s really not a drug. It’s actually an herb that belongs to the mint family and When the leaves are broken it releases a certain chemical that most cats respond to. Those cats that do react will eat it or lick it; some roll in it and others just sniff it. The catnip reaction is inherited so not all of them respond. 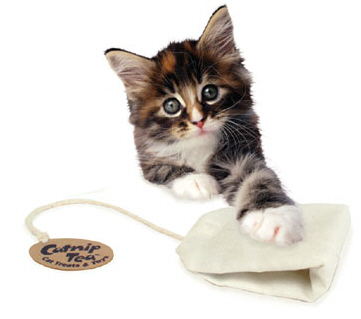 If your cat’s behavior doesn’t change around catnip it’s nothing to worry about. Catnip is completely safe and isn’t addictive to cats so give your feline friend a treat like our 100% Organically Grown Catnip. every now and then. The most amusing thing about giving cats catnip is the behavior change. Although it’s safe, keep in mind you can have too much of a good thing. Give your cat a catnip banana today.